Let’s check today how a Designated Intermediate System (DIS) is elected in broadcast network. Unlike in OSPF, in ISIS, routers of the same level, in a network segment, set up adjacencies (including non-DIS routers). DIS, as a pseudo node also generates LSPs, to describe available routers in the network. A pseudo node is indentified by the system ID of the DIS and the 1-byte circuit ID, which is always not 0. The main task of DIS is to reduce the number of generated LSPs. Even though all routers set up adjacencies in an ISIS broadcast network, LSDBs are synchronized by the DISs. One router can be DIS either for Level -1 or Level 2 routers. It depends on DIS priority configured. You can configure different DIS priority for different levels. The highest priority means the router is elected as DIS. In case that all routers have the same DIS priority, the one with the highest MAC address is chosen as DIS. By default DIS priority is set to 64 and can be changed manually. Comparing to OSFP DR, the router with the priority 0 also takes part in DIS election. Each time you connect a new router with higher DIS priority, the new router is elected as the new DIS, which causes LSPs flooding. Let’s leave theory and carry out a test of DIS election in ISIS broadcast network. 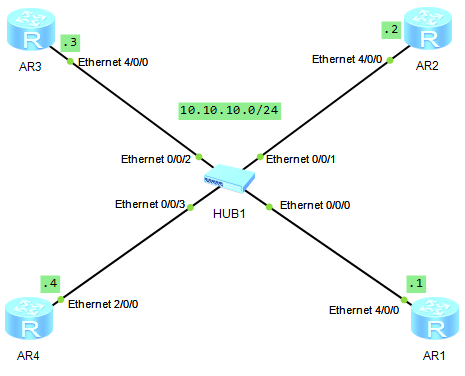 Based on the below topology configure, IP addresses for physical and loopback interfaces (it is omitted here). If you want to recall how to configure ISIS adjacency on Huawei routers, just go to ‘ISIS on Huawei routers‘. ISIS is a link-state IGP protocol. It gathers routing information from adjacent neighbors and uses the SPF algorithm to determine the best paths to destinations. I wouldn’t like to focus on the theory because you can find it in many sources. This article is a continuation of the basic BGP with Huawei CLI. All these prefixes are advertised by the routers in AS100 and pass to AS55. LabnarioR5 router has these prefixes in its BGP and routing tables, but cannot ping them. Why is it like that?